What does big blind mean in poker? 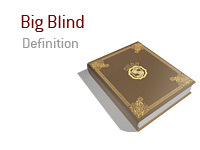 What is the definition of big blind in the game of poker? A big blind is a mandatory bet used in poker variations that typically don't have antes, such as Texas Hold 'Em. It is paid by the player two seats to the left of the dealer or the dealer button. The player one seat to the left of the button pays a small blind that is usually half the big blind's size. The dealer button moves clockwise around a poker table every time a hand ends, so every player at the table will eventually have to pay the big blind during a game. If there are only two players, one pays the big blind and the other pays the small blind. Blinds are designed to induce player participation and betting by forcing players to have a monetary stake in the game. Otherwise, there would be no financial motivation for players to collect more chips in a timely manner. Over the course of a game or tournament the blinds periodically increase in amount in order to compensate for the increased size of chip stacks. By manipulating the size of the big blind or the amount of time between increases it's possible to control the duration and stakes of a poker game. For an exaggerated but simple example of the importance of big blinds, imagine a tournament in which players start with $15,000 in chips. If the big blind is $1,000 and the small blind is $500, a single player will pay $1,500 for every lap the dealer button makes around the table, giving them ten hands to collect more chips before busting out. However, if the blinds double every thirty minutes it will drastically decrease the amount of hands a player can last using their starting stack, meaning that players are forced to gain chips quickly in order to survive. To do that, they have to participate in hands. Big blinds are typically the same amount as the minimum bet a player is allowed to make, which is a small percentage of an average stack. In a normal game or tournament players will always have a fair amount of time to collect chips, but the increasing blinds will eventually force them to participate at some point in the game.